Home Island Life After Being Pummeled in Nor’Easter: What’s Next for The Wall? After Being Pummeled in Nor’Easter: What’s Next for The Wall? 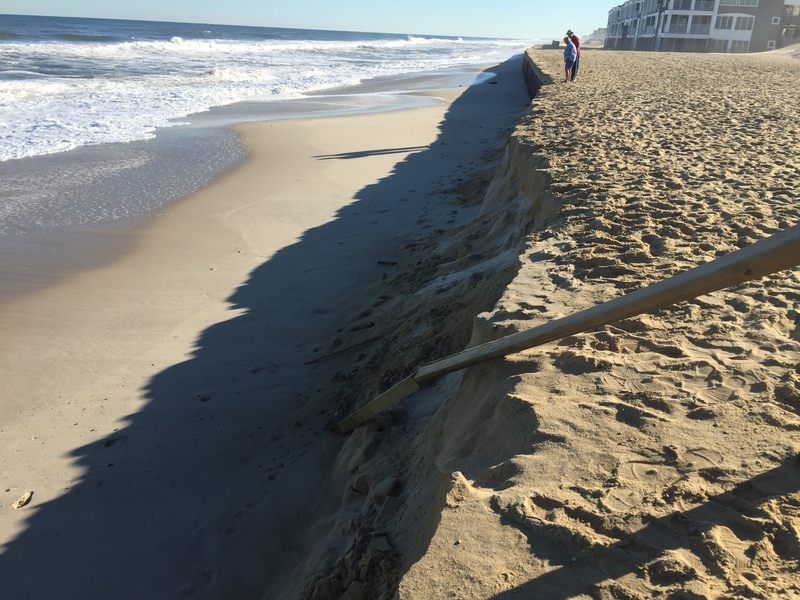 A nor’easter that exposed more than 10 feet of a sea wall along Brick Township’s oceanfront may be the first of a number of coastal storms that will affect the Jersey Shore over the fall and winter seasons. The wall, officials say, will have to keep up with all of them. In Toms River, sand has been trucked in repeatedly over the last week, both in preparation for the recent storm and to make an emergency berm during the storm as waves threatened to breach onto local streets in the Ortley Beach section. “If we didn’t have a wall, we would be doing the same thing, but we’re protected,” said Ducey, adding that trucking in sand would be a waste of money, especially considering days’ worth of sand trucked in before the storm was washed away by high tides before it even began. “It would be a waste of money – an easier way to do it would be to take a million dollars and just chuck it out to the ocean,” Ducey said. The wall was not designed to be used in the role it is currently serving – as a first-line storm protection measure. The 45 foot steel structure, which was driven 30 feet underground along much of its length through both Brick and Mantoloking, was supposed to be covered in a vegetated dune measuring 22 feet high. 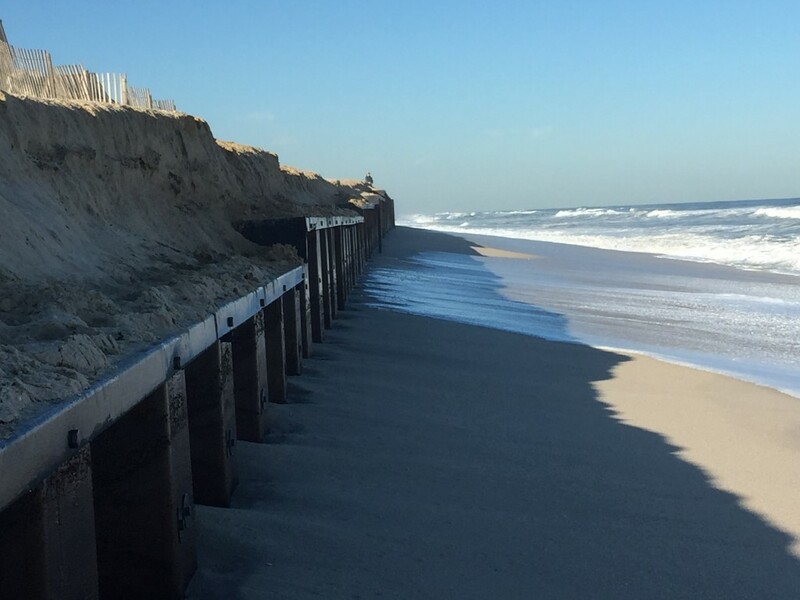 Only in the case that the dune was eaten away by a storm would the wall serve as a last-ditch effort to prevent a breach in the barrier island. But with legal wranglings between the government and oceanfront homeowners still mired in a long process of negotiations, condemnations and lawsuits, the U.S. Army Corps of Engineers has not been able to begin to replenishment and dune building operations, leaving the wall as Brick’s only protection in a season where as many as 10 or more additional nor’easters are predicted. That has led some residents to question whether being exposed to the elements will have an effect on the wall’s ability to protect the island, as well as its longevity. “There are some areas that still have the whole thing covered and then there are areas where we have exposure,” explained Eric Doyle, a Senior Environmental Engineer with the state Department of Environmental Protection’s Bureau of Coastal Engineering. Doyle said when the state was looking at materials with which to build the wall, both an epoxy-type material and a marine-grade steel material were considered. The state ultimately chose an A690 pre-rusted steel material. If the wall were never to have been exposed to salt water, the open air, and the elements as a whole, there was a chance it could have lasted 75 to 100 years. But the current exposure, the “worst case scenario” as Doyle put it, would still allow the wall to maintain the 50 year target period of longevity. The DEP has been inspecting the wall along with township officials since the storm, and in some areas, sand has started to return even in the 48 hours since the storm moved out. “What you see in a lot of the sections since the storm is that the sand has started to come back,” said Doyle. Despite the return of some sand, there are still safety hazards along most of Brick’s beachfront, and the total amount of sand lost will never return. 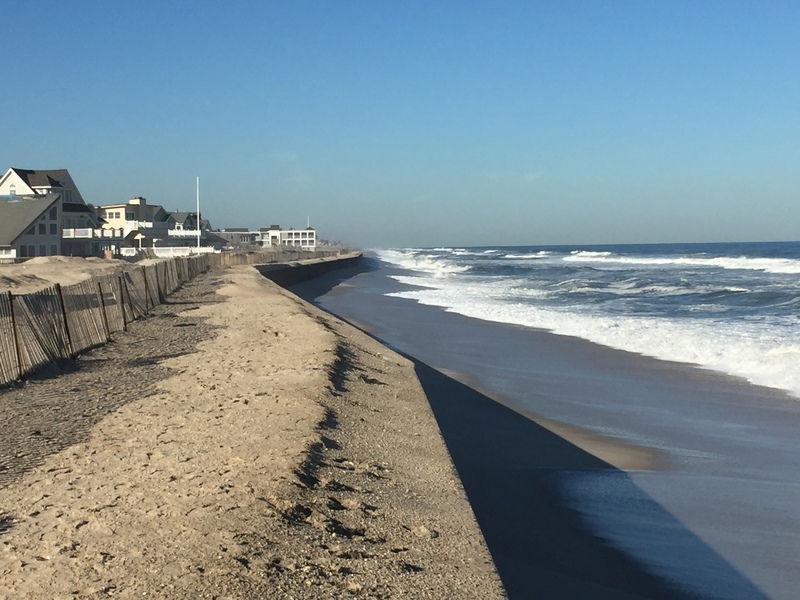 Brick has asked residents and visitors to remain off the beach for the winter season. If the federal replenishment project has still not begun when the summer season arrives, the township will be forced again to bite the financial bullet of trucking in sand to create beach entrances.